Ashley Nicole Style : Our 48 Hour Birthday Trip to L.A.
Our 48 Hour Birthday Trip to L.A.
A little over two weeks ago, Adam and I jetted off to L.A. for a fun filled 48 hour birthday weekend! The weekend flew by, but I wanted to share with you what we did while we were there in case you're planning a trip to the City of Angels. Once we landed on Friday, we braved the L.A. traffic and headed to our hotel, the SLS Beverly Hills. I had never stayed at one of the SLS Hotels before, but I had heard great things. From its avant-garde style, to its roof deck pool that had it's own DJ, and their restaurant, The Bazaar featuring James Beard Award winning chef, José Andrés, it had everything we were looking for. After we checked in, unpacked and freshened up, we headed up to the pool to grab a drink and a snack. We ordered chips, salsa and table side guac (hello Texans! ), with a margarita, of course. 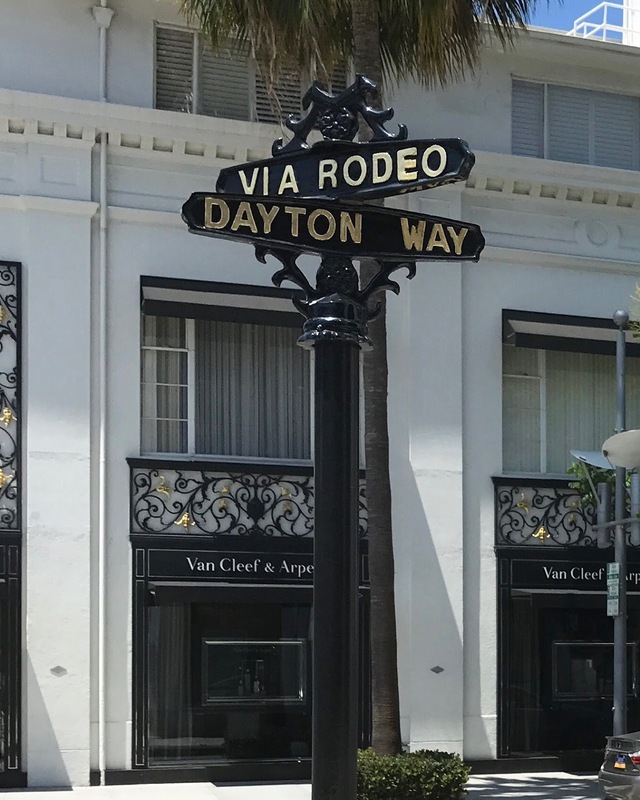 After enjoying some California sunshine, we headed to Rodeo Drive to do some shopping. Although it is a bit cliche, no trip to L.A. is complete without a visit to the luxury boutiques on this street. We did some window shopping before stumbling upon Ladurée, where we enjoyed our favorite macarons. We then headed back to the hotel to change for the evening festivities - dinner and baseball! We headed to Bestia in the Arts District for dinner. When I asked some friends for recommendations on must-try restaurants in Los Angeles, Bestia was consistently mentioned, and it definitely did not disappoint. We had a table on their gorgeous courtyard patio, and dined on the Charred Shishito Peppers, the Alla'nduja Pizza, which had housemade spicy 'nduja sausage, san marzano tomatoes, mozzarella, tuscan kale, fennel pollen on it (literally, so amazing), and had their homemade Agnolotti alla Vaccinara pasta (saffron pasta parcel, braised oxtail, brown butter. rosemary, pistachios, currants), as well. We topped dinner off with a Fig Crostata, with mascarpone ice cream and aged balsamic vinaigrette. Seriously, a MUST visit restaurant on any trip to L.A. - I can't wait to go back. Once we finished dinner we jumped in our Uber and headed to Dodgers Stadium. Adam is a huge baseball lover, and has long been a fan of the San Francisco Giants. When we lived in SF we went to a lot of the games, and it just so happened that the Giants were in town playing the Dodgers that weekend. His birthday trip was actually planned around getting the chance to visit Dodger Stadium, and see his favorite team play! Truth be told, I am not a huge baseball fan, but the things we do for love hahaha!! Dodger Stadium was absolutely beautiful, and although our team didn't win, getting to enjoy the vista from their gorgeous park, which was up in the hills, was well worth it. On Saturday we woke up early and headed to The Grove to do one of the notorious Hollywood tours. I know, I know, but I couldn't help myself! We've been to L.A. several times, but I'm a huge celebrity junkie, and love seeing celebrity homes, the Hollywood sign, the Walk of Fame, the Kodak Theater, etc. I found a great company, A-List Hollywod Tours, that had a quick and concise two hour tour. I knew that was going to be the only way I could rope Adam in to do something so cheesy with me. Although I know it's a bit touristy, it is a great way to see the city in a short amount of time. We did just that, and we had a fantastic time in our eight person, open air jeep! I highly recommend them if you're looking to do a tour like this. We wrapped up our tour back at The Grove, and roamed around their Farmer's Market and the stores before getting a bite to eat. After sitting and eating our way through the morning, we walked to the Los Angeles Community Museum of Art (LACMA). I had seen their outdoor "Urban Light" installation by Chris Burden, popping up on Instagram for the past few months, and I knew I had to get some pictures! Of course it was busy with everyone doing the same thing, but we had a lot of fun taking a few snaps, and roaming around the museum. From there we went and shopped along Melrose, before heading to Roberston Ave. We took a quick pit-stop to grab a drink at the poplar restaurant A.O.C. before heading back to our hotel. When we got back to the SLS, we changed into our suits, and enjoyed some downtime by the pool. That evening, we got all dolled up for Adam's birthday dinner. We started out with a drink at The Bazaar in our hotel (which was a scene), before we headed to local favorite, The Grill on the Alley, in Beverly Hills. We enjoyed their Garlic Cheese Bread, Filet Mignon, Chipotle Cheddar Cream Corn, and their Lobster Mashed Potatoes (a must - so out of this world)! Of course I couldn't miss an opportunity to have another birthday dessert waiting for him, so we finished the meal with cake! To say we were full would be putting it mildly! On Sunday morning, we woke up and went to The Ivy for brunch, before we packed our bags and headed to the airport. As you can see, we fit SO much into our two day trip. In hindsight, I wish I would have "scheduled" some more downtime for us, because we definitely came home tired, but can you blame me for being a little overzealous?! From five star restaurants, to poolside cabanas, museum visits, and of course, shopping, L.A. made for the perfect birthday getaway!